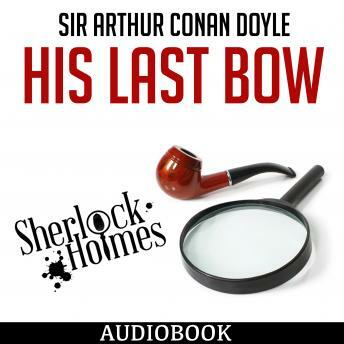 His Last Bow  was meant to be the last of the Holmes stories, and is given the subtitle An Epilogue of Sherlock Holmes . Doyle did pen and publish a subsequent collection of stories, The Case Book of Sherlock Holmes, but all the stories in that collection take place  a decade or more before His Last Bow.  The story is unusual in that it is one of only a couple of Holmes stories not written in the first person; most of the Holmes' stories, and all of the novels are written from the point of view of Dr. Watson, Holmes' faithful companion, and a few stories are written from Holmes' own perspective. This story, though, was written in the 3rd person, perhaps because Doyle wanted to present this story of espionage thwarted in such a way that Holmes' entrance comes as something of a surprise, though the subtitle kind of serves as a spoiler.